Bound eternally by a cord of love." We are all sad beyond words. That is a beautiful tribute to Alex. We are very sad that he has gone to the Bridge. I didn't know Alex but so sorry to hear the sad news. It is such a beautiful and heartfelt tribute to him. We are so, so sad about our friend Alex running off to the Bridge. We miss him, and will never forget him. Your tribute to Alex was so beautiful and moving! All of us are so lucky to have you in our lives. You have a special gift and are so deeply connected with each and every reader, every fan! You are guardian angels. We are so blessed. Very sweet post. We stopped by to purr for Alex's family. Oh no! 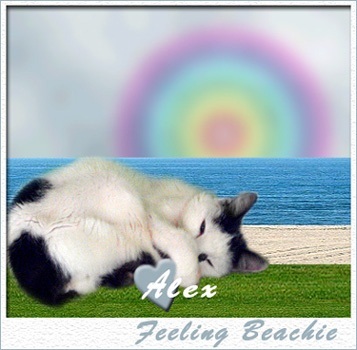 I didn't want to face the fact that Alex was nearing Rainbow Bridge! I so enjoyed his posts and his humor and his romance with Gracie and I am saddened that his life has come to an end. Poor Hilary! I appreciate that you passed this info along so that I can reach out to Hilary and her hubby. My sympathies to Alex's family. Such a beautiful tribute to Alex. We are sending comforting thoughts to his family. Nice tribute to Alex. Very sad. So sad that Alex had to leave for the bridge. Today we're all remembering our lost loves. Alex is very good company. I´m sad about this notice. That is such a lovely tribute and poem for Alex. We are so sad about him too. Thanks for this. Lovely tribute to Alex. We are so very sad for his fmaily. So sorry to hear about Alex, there's one my angel in heaven now. We are so sorry for the loss of your sweet friend Alex. We leave you lots of warm hugs. What a loving tribute to a very fine mancat. Alex will be greatly missed. What a great post Caren! Alex was such a cool cat.